In the past years, new opportunities arise after my graduation project Form Follows Organism. 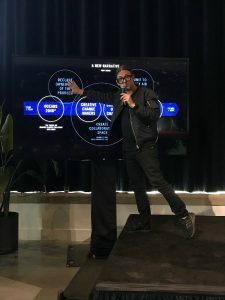 Since two years I am the founder and creative director of BlueCity Lab based in BlueCity Rotterdam, the incubator for circular entrepreneurs in and around Rotterdam. Ever since I started with the concept of the lab, my passion about biofabrication and biodesign literarily grew. This started at the studio of Suzanne Lee, the best-known person in the field of biofabrication. 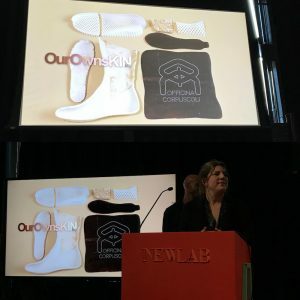 Back in 2014, Suzanne founded Biofabricate, a now annual summit to unite design, biology and technology. The idea for the conference was based on the fact there was no conference where design, tech and biology are merged, only science or design. Biofabrication is a biomedical definition, but nowadays it imagines a world of materials and consumer products, grown by organisms. From algae, bacteria, fungi to mammalian cells, they are able to grow nature’s materials with new functions. With old techniques like fermenting to synthetic biology, designers, scientist and engineers reimagine and redesign our new world. 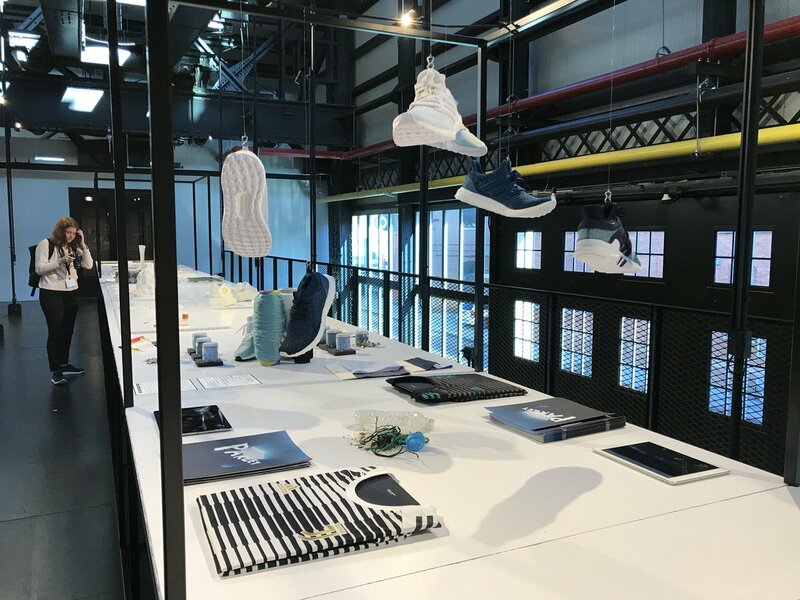 This year, we celebrated our fourth conference, this time held at New Lab in the Brooklyn Navy Yard. New Lab uniquely supports entrepreneurs working in advanced technology—in disciplines including robotics, AI, connected devices, nanotechnology, urban tech, and more. Companies like Terreform ONE and Modern Meadow are housed in the same building. Biofabricate is a one-day event featuring leading companies, designers and scientist from all over the world, speaking about their materials and the process of scaling. Next to the conference, we build an exhibition where attendees experience biofabricated materials. 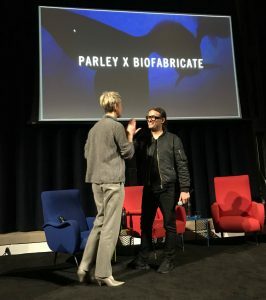 Parley for The Oceans was our event partner and presented their new trainers made from ocean plastic, a collaboration with Adidas. Decorated with wave-patterned stitching, the shoe is available in two colour combinations: dark navy and blue, and white and turquoise. Its moulded heel counter – the section at the back of the shoe – is made from recycled plastic, while the outsole is made from recycled rubber. Parley provided our volunteers with their latest pair of trainers. Founder Cyrill Gutch mentioned that we have to focus less on recycling plastic, and focus more in ending the use of it entirely. Reduce, Reuse and Reycle is outdated says Gutch. He replaced this with ‘AIR’, which stands for Avoid, Intercept and Redesign. Instead of repurposing plastics, we need to redesigning them from the start. This vision is shared by many of our attendees and speakers at biofabricate. My role as production associate is to co-organise this conference. As you might know, we have a lot of good biodesigners in the Netherlands, next to visionairs who have attended previous Biofabricate conferences like Koert van Mensvoort. One of them, Maurizio Montalti attended most of the years. 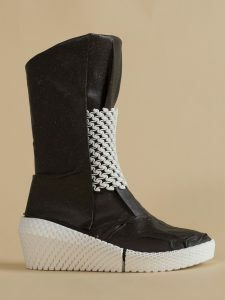 This year, he presented his Mars Boot, a collaboration with UK-based shoe designer Liz Ciokaljo. Amongst Maurizo and Liz, we had other great designers and companies from the field like Natsai Chieza from Faber Futures, Ginger Krieg Dosier from bioMASON, Eben Bayer from Ecovative Design, Dan Widmeier from Bolt Threads, Karl Schmieder from MessagingLAB, Molly Morse from Mango Materials, Christina Agapakis from Gingko Bioworks, Andras and Gabor Forgacs from Modern Meadow and Veronika Kapsali, writer of the book ‘Biomimetics for Designers’. Their shoe is also part of the ‘Items: is fashion modern?’ exhibition in MoMA, as well the ‘graphic t-shirt’ from Modern Meadow. 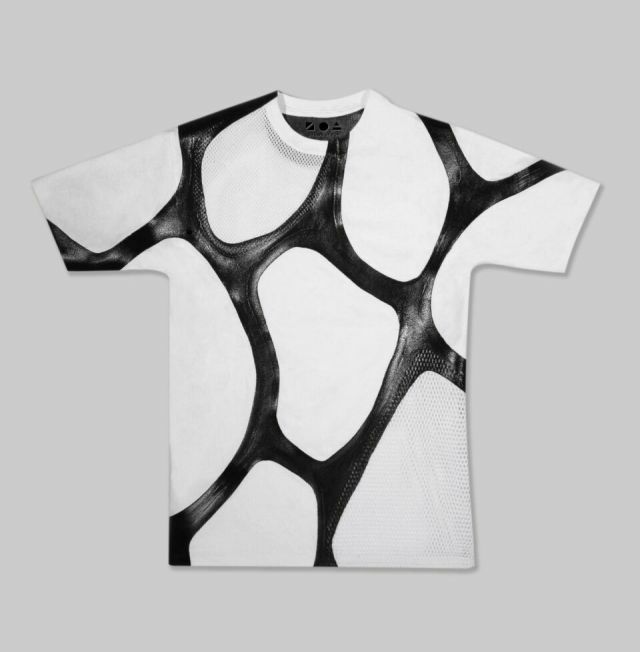 This shirt partly exists out of biofabricated leather. This animal-free material is created from a genetically engineered strain of yeast to make collagen—the same collagen as in your skin. Zoa is the world’s first bioleather materials brand by Modern Meadow. Suzanne is creative director at Modern Meadow as well Amy Congdon leads the lab as senior materials designer. ZOA was also exposed in Modern Meadows office during Biofabricate. The most fascinating and energizing fact of this conference is caused by the people who are working on this emerging field and new paradigm. Over the years, we have seen different materials grown from lab to market, from small studio to museum and from lab to large facility plant. I can not wait until next year, when we celebrate our fifth anniversary of this amazing conference.